Bay Colony Railroad GP-9r No. 1702 leads the morning train of empty trash cars back to the Yarmouth transfer station, on December 26, 2002. The train is crossing Summer Street, on the South Dennis branch. Dennis Pond is on the left. Important Notice: Check out the All-New Cape Cod Rails, at www.capecodrails.com! But don't worry, this, the "original" Cape Cod Rails won't be going anywhere (at least not until I add all of the information and photographs from this site onto the new one). 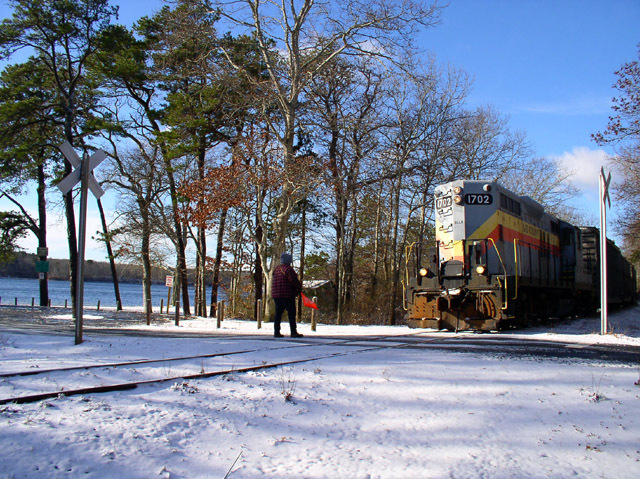 Welcome to Cape Cod Rails, my personal website devoted to railfanning and railroading both near and far from Cape Cod, Mass. For ease of navigation, this website is divided into frames, with all contents appearing in the left frame. Click on something in the left frame and it will be displayed in this frame. (In some cases, on pages with many pictures that don't fit well in this frame, a second browser window will open.) The newest content always appears at the top of the list on the left. I'm pleased to announce that the latest additions are magazine advertisements for the Budd Company. Most of these date back to the 1950s, and include ads for RDCs as well as conventional railroad equipment. Another recent addition is interior and exterior photos of the historic railroad station in West Barnstable, MA . This station was built in 1912 by the New Haven Railroad. This would be a great candidate for restoration, and the Cape Cod Chapter NRHS is hoping to do just that. I hope you enjoy your stay, and please feel free to e-mail me with any comments, questions or suggestions that you have. Search Cape Cod Rails, and find just what you're looking for! Visitors since August 22, 1998.